The Density slider determines how many gray link-spheres are drawn between parent ZSpheres when editing. The Color Intensity slider affects the way link-spheres are displayed in a ZSphere object. Normally they are displayed darker than the parent ZSpheres; this slider determines the percentage-intensity of the parents’ colors to use. If this slider is set to 100%, they are displayed at full color intensity. The Display Size slider is helpful when editing a densely-packed ZSphere model. It determines the relative display size of each ZSphere; changing this slider to a smaller value enables you to gain better access to individual ZSpheres. This slider does not impact the model’s geometry or its generated mesh. The Smoothness Subdivision slider applies a smoothing effect to sharp edges of this 3D object. Higher values apply this effect to a larger portion of the object. This slider has no effect on the object’s true geometry, only on how it is drawn on the canvas. To apply a smoothing effect to the object’s polygons, use the Smooth slider within the Deformation sub-palette. The Draw Resolution slider affects the way the current 3D tool is drawn on the canvas. Depending on the number in this slider, polygons will be added or reduced before rendering the object. This button only affects the object’s appearance on the canvas, and does not affect its true geometry. Polygon dividing, which does alter the object’s geometry, can be performed using the Divide button in the Tool > Geometry menu. BPR Transparent Shading button specifies that the selected SubTool will be transparent when rendering using BPR. For SubTools to be rendered transparent, the Transparent button in the Render > Render Properties sub-palette must also be switched on. 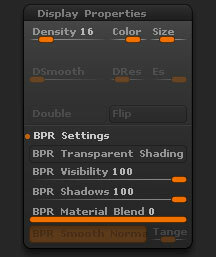 The BPR Invisible slider will set the degree of transparency for the selected SubTool. 0 is completely invisible, 100 is completely visible. The BPR Shadows slider will set the intensity of the shadows cast by the selected SubTool. A setting of 0 will mean the selected SubTool does not cast shadows. The BPR Material Blend slider allows the material blend for the selected SubTool to be set relative to the Material Blend Radius set in the Render > Render Properties sub-palette. Each SubTool can therefore have its on material blending effects. When the BPR Smooth Normals option is turned on, the edges of the polygons for the selected SubTool will be smoothed at render time. This avoids the need to add extra subdivision levels to give a smooth mesh and low resolution meshes will look smooth. The SmoothNormals option in the Render > Render Properties sub-palette must also be switched on.